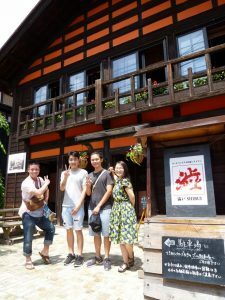 I came here, Tokamachi Niigata prefecture, with my friend, Fone on 4th, 5th August. 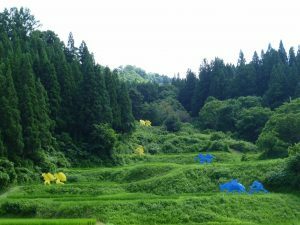 Although it is the first time to come here, I was surprised because Tokamachi is so artistic and filled with nature than I expected. I want more people to know about Tokamachi, so I am writing. So cool Happi coat, which is a traditional Japanese piece of clothing, often worn during festivals. 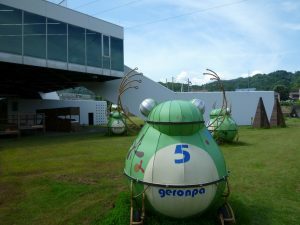 Tokamachi is a city where nature and art mixed. Nature lovers and art lovers will like it! Now I will introduce it! First, we head to a terraced rice field. 40mins by car from the city center, we arrived at Matsudai city. During we were heading there, the building was the magnet for us. The building is cafe called Shibui which means Vintage literally. A German built this house which he renovates. Old Japanese house changed to a fashionable and cozy house. Not only outside but also inside is looking good! 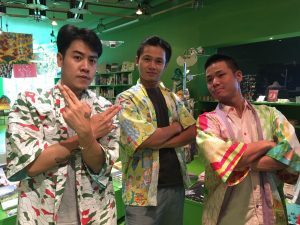 Shibui is just cafe. But there is a fancy fireplace, many brochures introducing other places. It is like a museum! I’d love to live here! It is a good idea to change an old house to a traditional and modern house. After we took a break, head to terraced rice field finally. 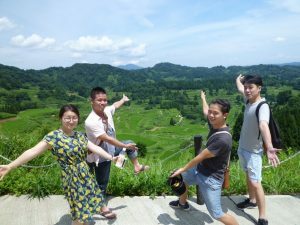 However Taiwan has terraced rice field actually, I haven’t seen it because I stayed in the city, never been countryside. The view from the top of the mountain is so magnificent. Nature makes me feel relaxed, forget Taiwan busy days. As I see rice field, I was getting hungry. I was sure that the rice around here should be good quality. My mind totally occupied with lunch, lunch, lunch… hard to stop drooling. Sato Yama restaurant waited for us. 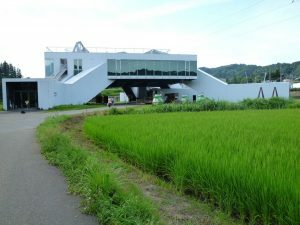 The restaurant itself is surrounded by rice field. At the entrance, a Frog monument is saying hello. we are surprised when we get in there. The wall and floor are blue! Making me cool down! There is a painting on the ceiling. 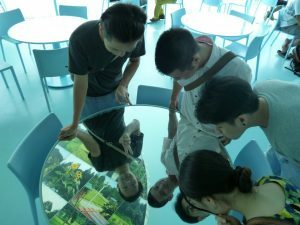 The table is a mirror! It is the first time to be surprised before eating something in a restaurant. 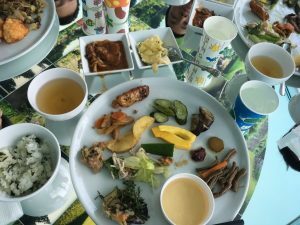 The lunch is all you can eat buffet. I took all kinds of food. But most food is made by vegetable so it is healthy food. Every food is super good taste. 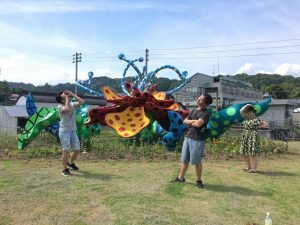 I did refill again again again…..
After eating lunch, we looked around some art field festival artworks. 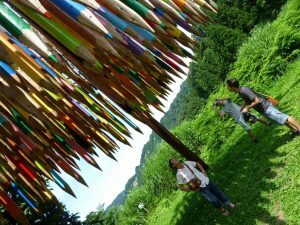 Tokamachi is known as art festival place called art field festival. Tokamachi has that festival every 3 years. You will see it next year”2018″. So there are a lot of artworks in Tokamachi. This city is filled with artworks! How awesome it is! It makes us take artistic posture. Wow, big pencils are falling!!! Every those pencil are written a country name, why don’t try to find your country name? I tried to find Taiwan. But Keeping looking up is so hard. I tried 10 mins, but I got neck ache…and then I gave up! I will find next time for sure! From the roof of the building, I could see this view. Some animal status is decorated on a terraced rice field. It’s interesting! 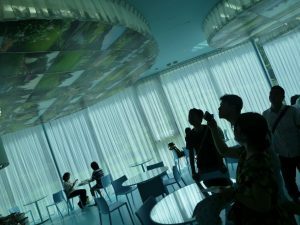 After enjoying lunch and artworks, we departed to beech forest. Spring water! On our way!